On June 20 1776, Pennsylvania battalions of the Continental Army began constructing a five-bastion fort for General George Washington (1732–1799) at the intersection of present-day Fort Washington Avenue and 183rd Street. Their quickly assembled, earthen-walled structure had no water supply and no significant barricade to repel attackers. The highest hill on Manhattan island was an ideal location for the fort, with its views overlooking the Hudson River to the east, the valley of Manhattan as far south as what is now 120th Street, and protection on the north side from Fort Tryon. Unfortunately, Fort Washington’s prime position did not spare it from British bombardiers. British, and Hessian forces captured this last American stronghold in Manhattan on November 16, 1776, as General Washington watched helplessly from Fort Lee on the New Jersey side of the Hudson. The overall battle of New York City, from Manhattan to Long Island, cost the Continentals several hundred lives and over four thousand prisoners of war. The British army and its sympathizers then occupied the city until the American victory in 1783. Wilhelm, Baron von Knyphausen (1716–1800), a German general in British service, was commander of New York from 1779 to 1780 and what remained of the American fort was renamed Fort Knyphausen in his honor. After the war, vestiges of the Fort disappeared, and the surrounding area became known as Washington Heights. Granite paving outlines the former contours of Fort Washington in the southern portion of nearby Bennett Park. For the 200th anniversary of the Battle of Fort Washington in 1976, the Washington Heights-Inwood Historical Society re-enacted the conflict on the site of the former fort. The Laws of 1894 mapped this park, which now stretches from 155th Street to Dyckman Street and from Riverside Drive to the Hudson River, as parkland and named it Fort Washington Park. The City of New York officially acquired most of the property in five separate parcels between 1896 and 1927, all through condemnation. Parks was granted jurisdiction at the time of those acquisitions, but some additional parkland was added from the Port of New York Authority (1939), the Board of Estimate (1966), and the Department of Real Property (1989). In the early 20th century, many construction plans circulated for this parkland. In 1912, the West End Hotel wished to build a sister facility with views of the majestic Hudson. Developers advanced plans to build an open-air stage and comfort station on the shore of the Hudson in 1913. The theatre was to be a reproduction of an ancient Greek theatre in Taormina, Sicily. Each time the threat of encroachment loomed, the neighborhood organizations of Washington Heights fought to protect their green space. Inspiration Point Shelter, on Henry Hudson Parkway at 190th Street, opened in 1925 as a resting place for pedestrians and leisure drivers. Designed by architect Gustave Steinacher in 1924, the neoclassical sitting area opened a year later and quickly became a favorite of Hudson River tourists. 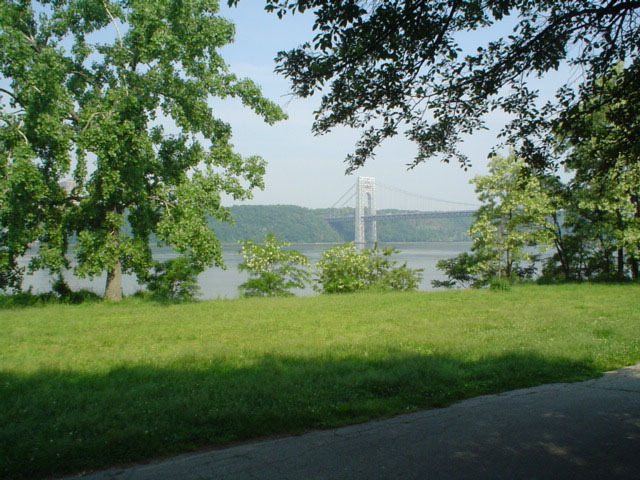 In 1927, the Board of Estimate allowed Parks to relinquish control of a parcel of land at 179th Street for the Port of New York Authority’s construction of the George Washington Bridge. When it was completed in 1931, the steel-cabled beauty was the longest suspension bridge in the world.